New Delhi: Newly discovered coal reserves in Chhattisgarh could make it difficult to create three elephant reserves meant to check rising human-animal conflicts. The ministry of environment and forests, or MoEF, has ordered environmental impact assessment of the coal blocks in Badalkhol, Lemru and Tamorpingla areas of Korba district that are located inside the proposed reserves. These mandatory assessments gauge the environmental effects of industrial, mining and infrastructure projects before the ministry approves of them. “Yes, after the (discovery of) coal blocks, there has been reconsideration about the boundaries of the reserves and how to adjust it to allow mining," said Arun Pandey, a conservator of forests in Chhattisgarh. However, MoEF officials declined to comment on the issue. 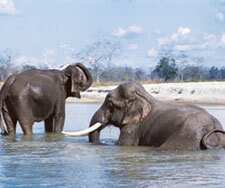 The state government secured approval for the elephant reserves in August 2007 from the National Board for Wildlife, or NBW. The reserves were to be spread across Raigarh, Korba, Sarguja and Jashpur districts of the state, where elephants have raided human settlements, damaged crops and caused injuries and deaths. Last year, an expert team of MoEF visited the area to ascertain whether elephant reserves will reduce such conflicts. The forest department had said 426 villages were affected in Sarguja district alone. The expert panel suggested forming three elephant reserves in its report in May 2007. Meanwhile, the Chhattisgarh arm of lobby group Confederation of Indian Industry, or CII, has asked the forest department to reconsider forming the elephant reserves in coal-bearing areas. “The proposed elephant sanctuary, if finalized at the proposed location, will block at least 40mt of coal per annum…, thereby causing loss of revenue to the tune of about Rs350 crore per year to the state government," the lobby wrote to the forest department in a letter dated 5 February. The letter added that state-owned explorer Mineral Exploration Corp. Ltd has found about 13,000mt of coal reserves in areas that come within the boundaries of the proposed reserves, out of which four blocks have already been allocated. A state forest official, who didn’t wish to be named, said more coal blocks are likely to be allotted in the area. “The Korba area of Chhattisgarh has numerous thermal plants, for which the coal mines are essential," he said. Popularly known as the power capital of India, Korba is peppered with power plants that generate more than 4,700MW of electricity. The state has the potential to produce an additional 50,000MW, according to the state government website. Large-scale coal mining and power production have, however, taken their toll on the environment. The environment ministry has declared Korba as a “critically polluted area". Letters sent from the Korba forest division to forest department headquarters in November and December 2007 said any change in the boundaries of the elephant reserves would hamper the basic purpose of providing for an elephant corridor to connect the different habitats of the animal, the official added. Once the state government decides to go ahead with the corridor, it will be difficult to get clearances for any mining activity. “All issues related to environment and forests will have to be scrutinized and cleared when that stage comes. Mining licence is granted only with clearance from forest and environment departments," said state mining secretary Baijendra Kumar. Sudiep Srivastava, a Chhattisgarh-based advocate and environmental activist, said, “Chhattisgarh has 55 recommended coal blocks, out of which only a handful are working. The state is reeling under environmental pressures of heavy mining. For the sake of conservation, having a couple of less coal blocks won’t impact (mining efforts)."